You have to love tools that help to make working life easier. The Rapid Warrior Combo Knife and Hand Saw from Rapid Tools looks to be one of them. 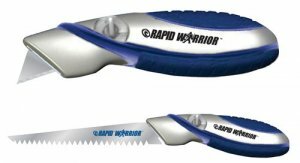 While most utility knives only use knife blades, the Rapid Warrior can use both standard utility knife blades as well as any standard 1/2-inch reciprocating saw blade. Many times when you have small cuts to make on the job, it is not worth it to make a trip to the truck to get a reciprocating saw. With the Rapid Warrior, all you have to do is keep a reciprocating saw blade in you toolbox, and you will always be prepared. case, all for under $20 retail. You can also purchase both knives and blades individually.